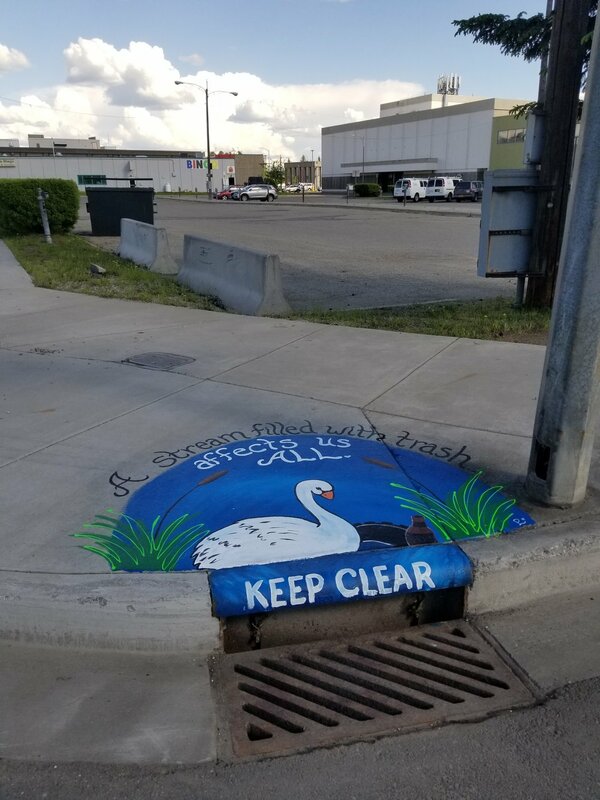 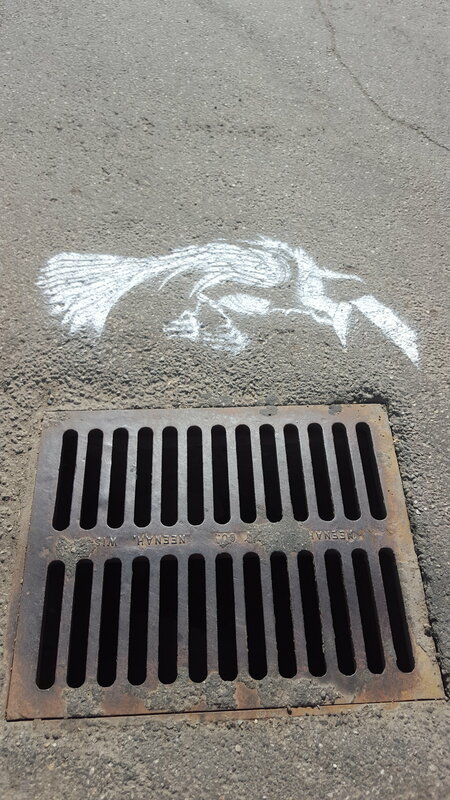 Since 2014, TVWA has invited local artists to submit design proposals for storm drain art in downtown Fairbanks. 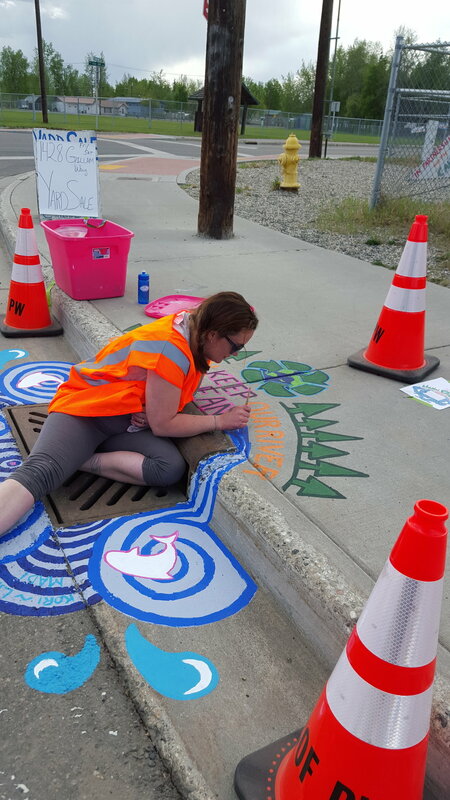 The purpose of this project is to raise public awareness that ALL storm drains flow directly into the Chena River and to provide an opportunity for artists to create public works of art in the downtown and surrounding Fairbanks area. 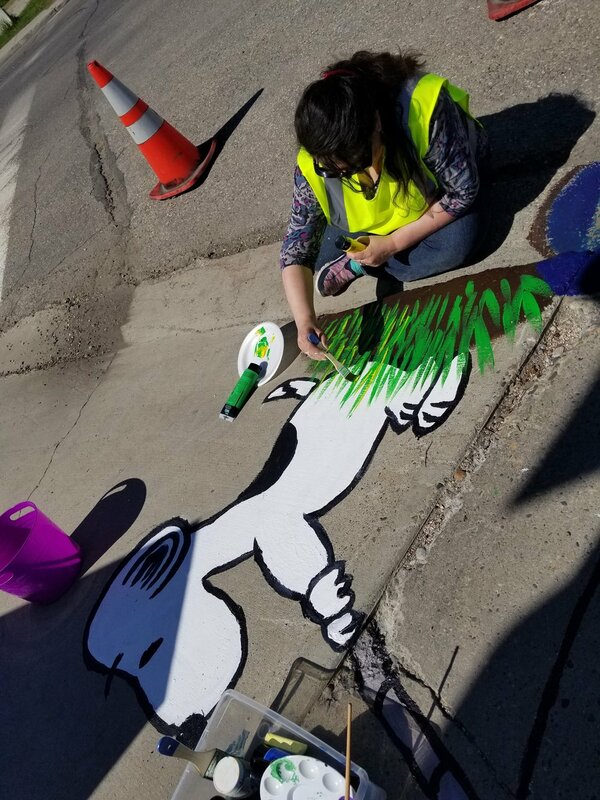 The past art was displayed for one year prior to the construction on Cushman Street (2014) Noble Street (2015), Cowles Street (2016), Gilliam Way (2017), and Barnette Street (2018). 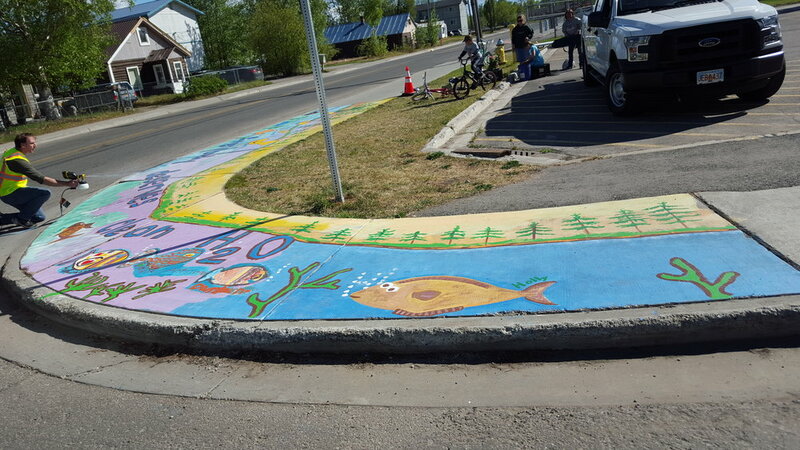 This project has garnered local, state and national attention. 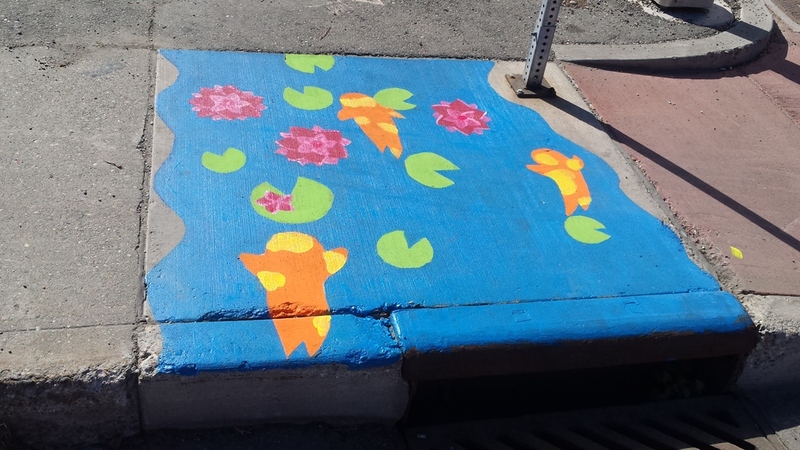 During the month of April - TVWA asks local artists to submit their art proposals to TVWA. 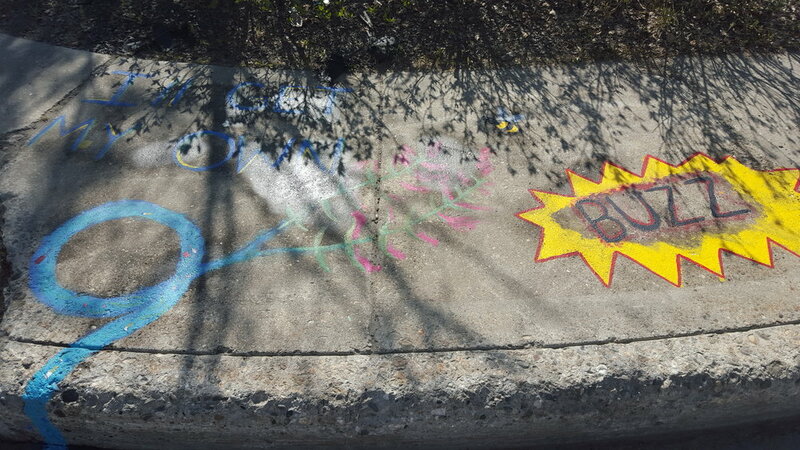 The artist are asked to consider the following design ideas for their art entries. 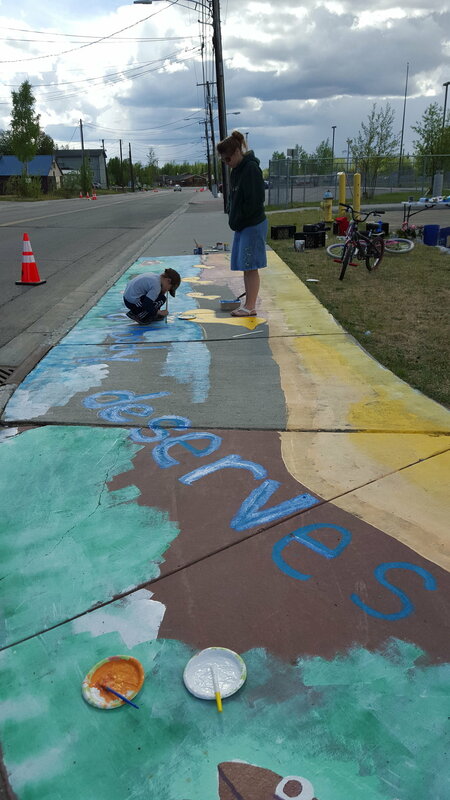 When designing the artwork, artists were encouraged to think of the following three themes. 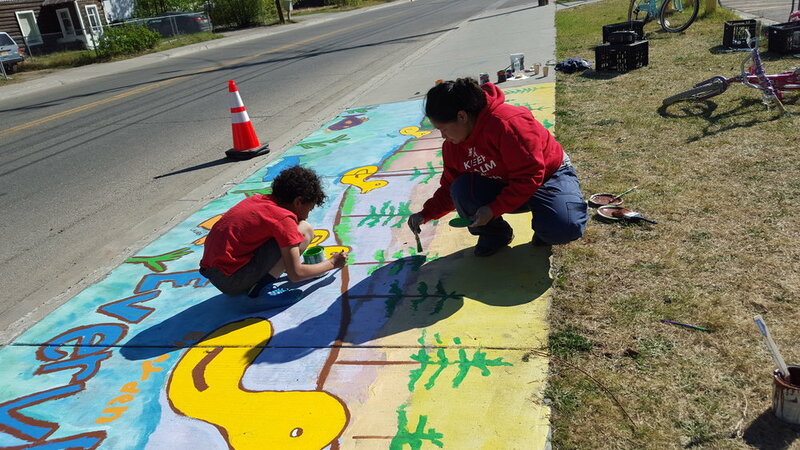 After the deadline - TVWA has held 1st Fridays, Earth Day / Arbor Day Celebrations, Open Houses, and Summits. 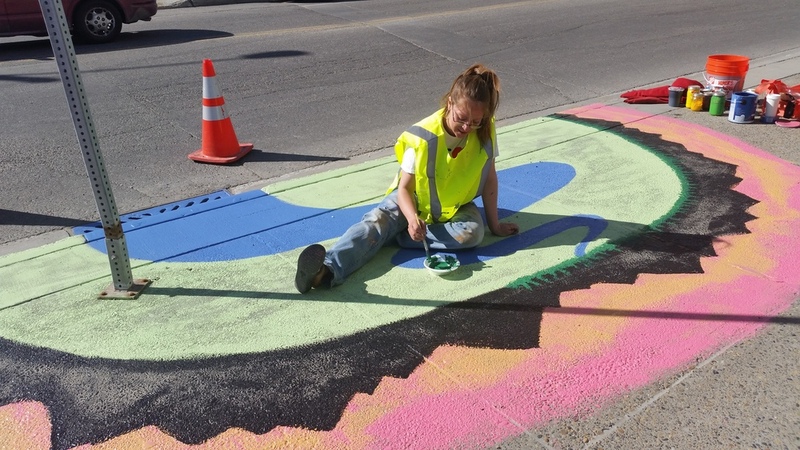 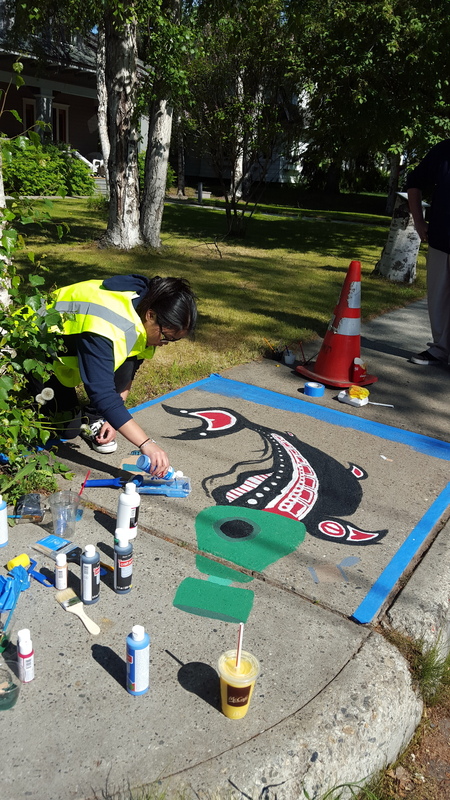 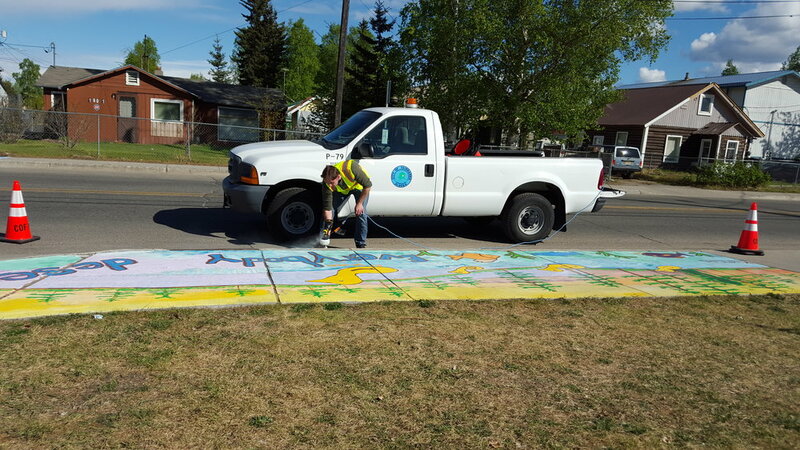 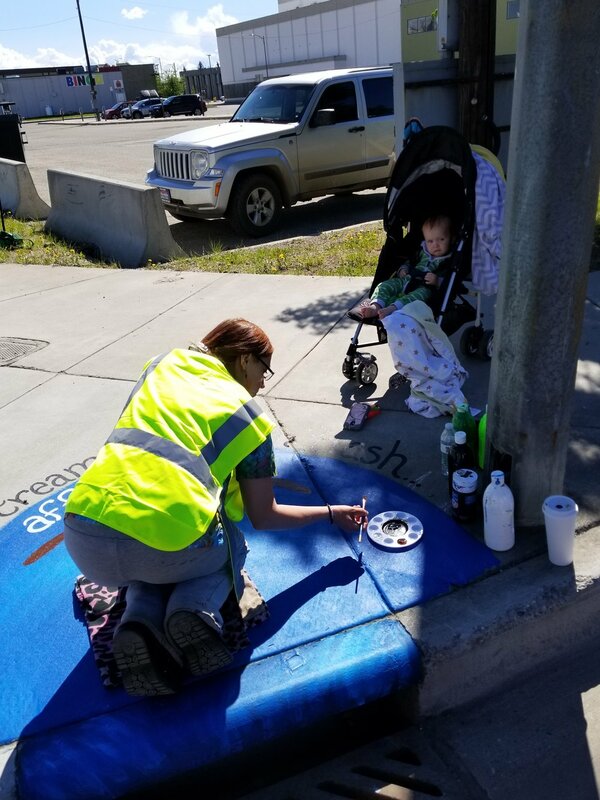 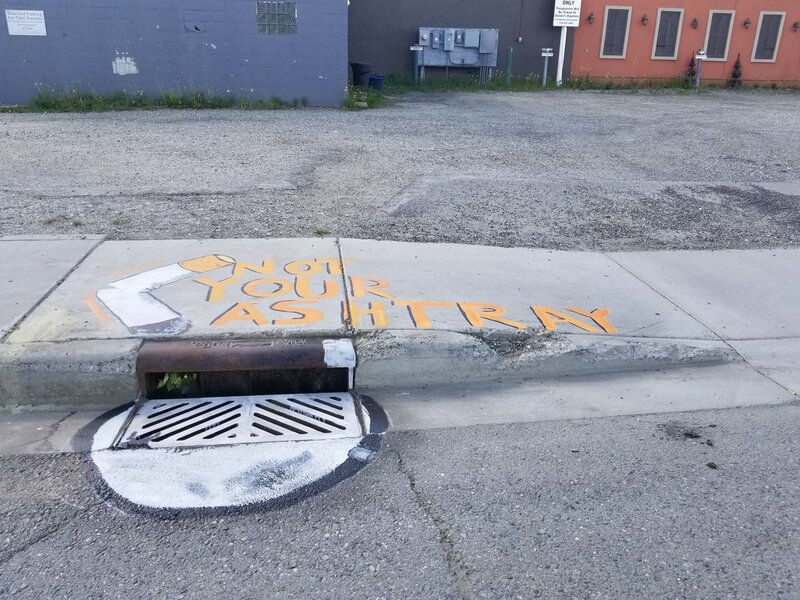 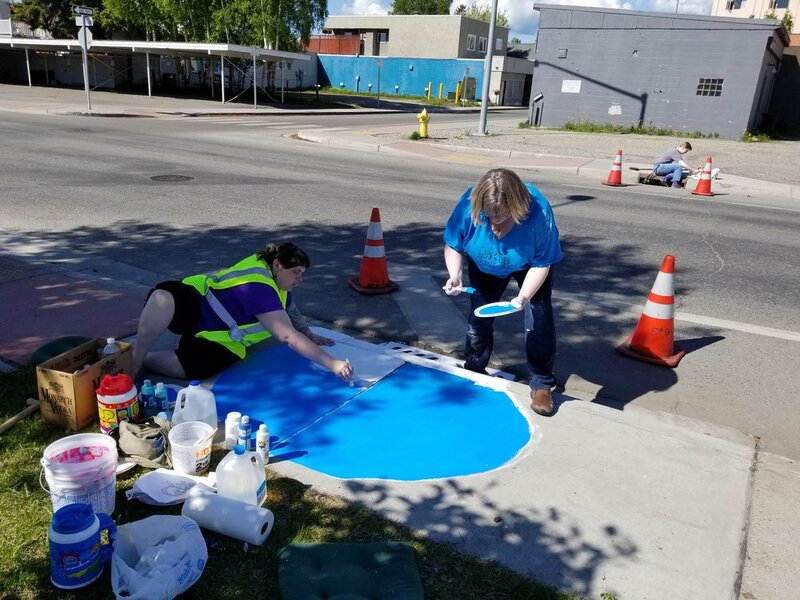 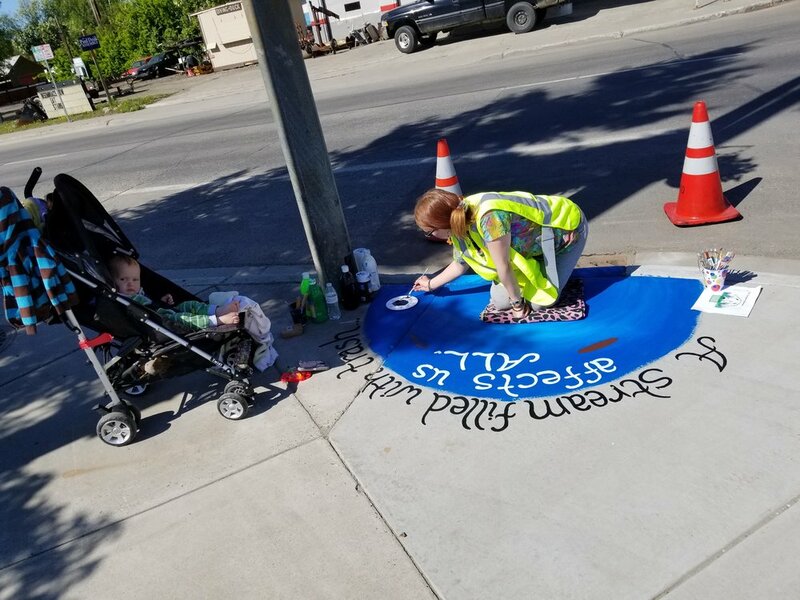 During these events - the public picks the winners and we coordinate with the City of Fairbanks on which art / artists paints on what storm drain - to make sure the art fits the best storm drain and sidewalk. 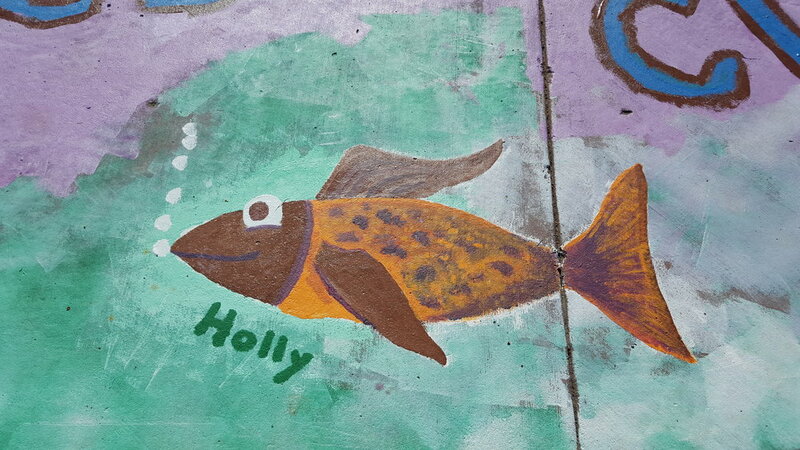 We then contact the winning artist with the location and date for them to paint. 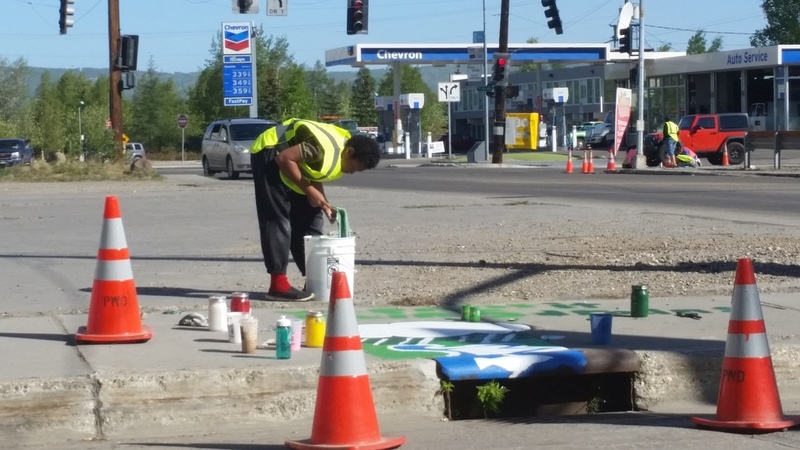 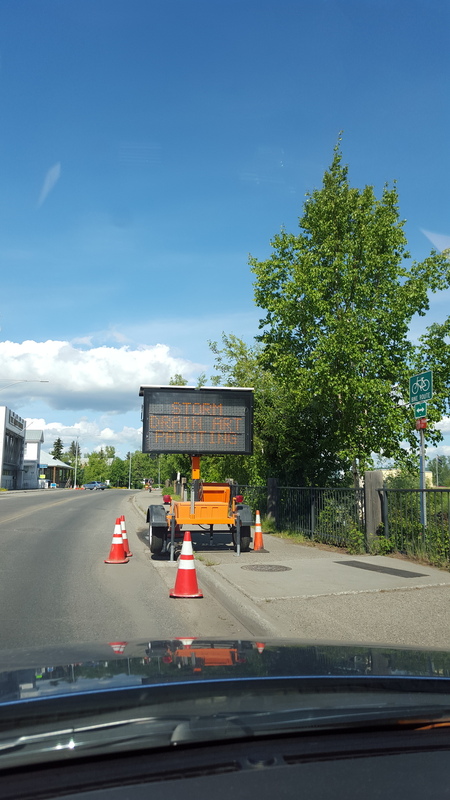 The City of Fairbanks works with the Division of Transportation to put out signs for traffic revision and cones for artists safety. 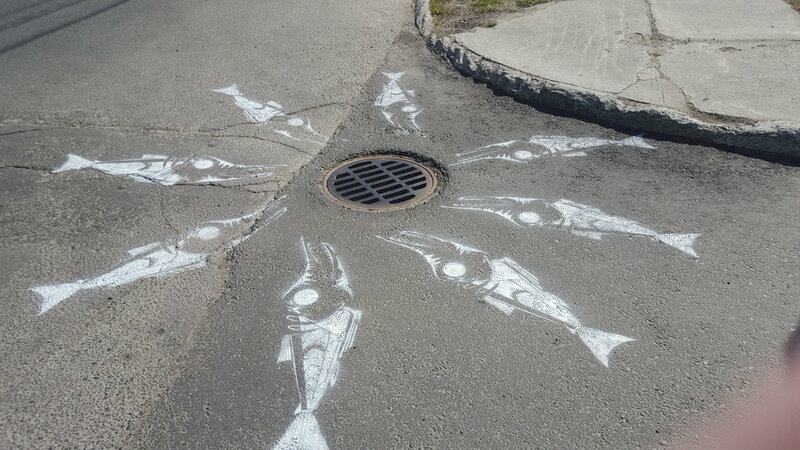 The artists are allowed all day to paint their storm drain. 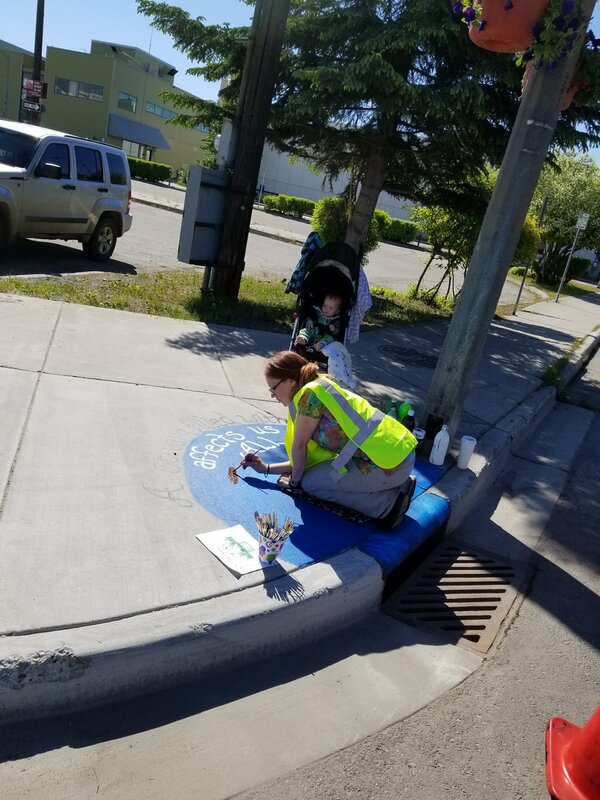 Staff from TVWA and the City of Fairbanks are on site to help with any questions they might have. 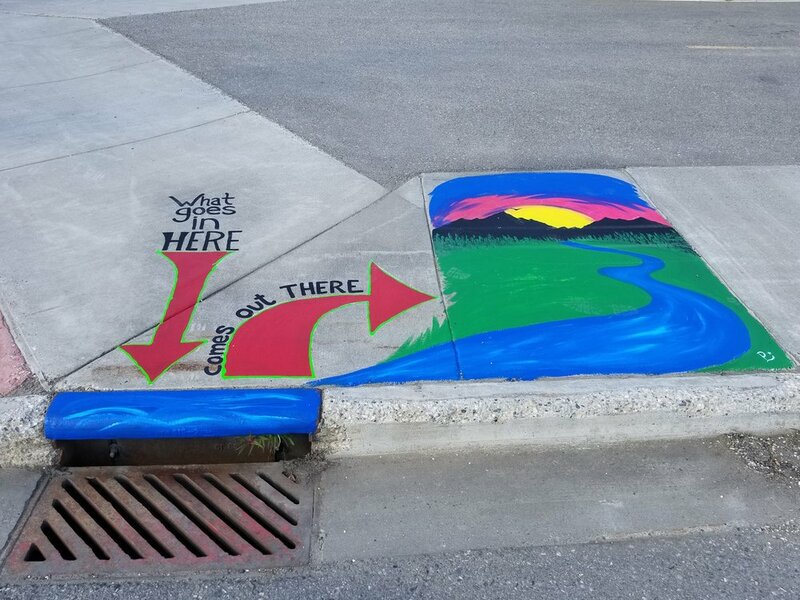 The City of Fairbanks then seals the art on the storm drains and everyone gets to enjoy the colorful pieces for the rest of the summer. 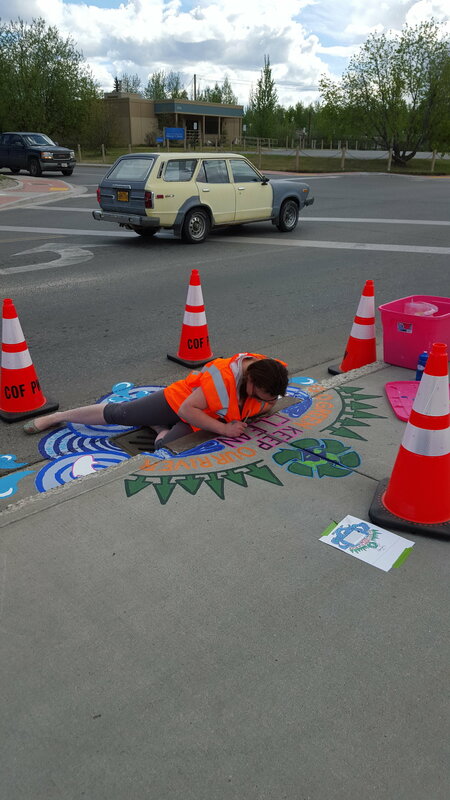 Our Partners: TVWA is proud to host this event, but it wouldn't be possible without the wonderful local support and many partners. 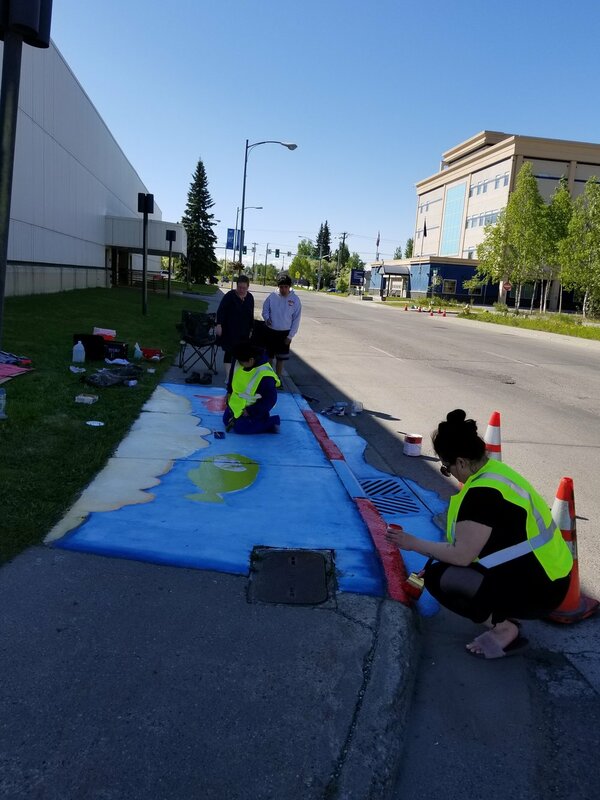 The City of Fairbanks, the Fairbanks Stormwater Advisory Committee, the Downtown Association of Fairbanks, Project Fairbanks and Festival Fairbanks. 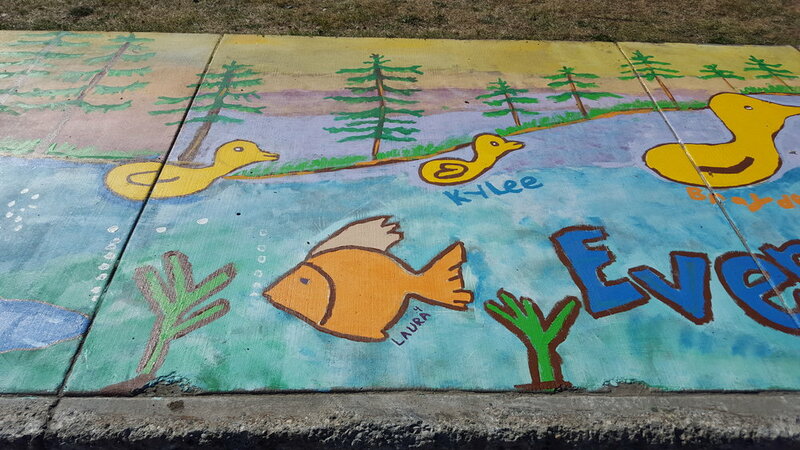 This is just a brief summary of this project. 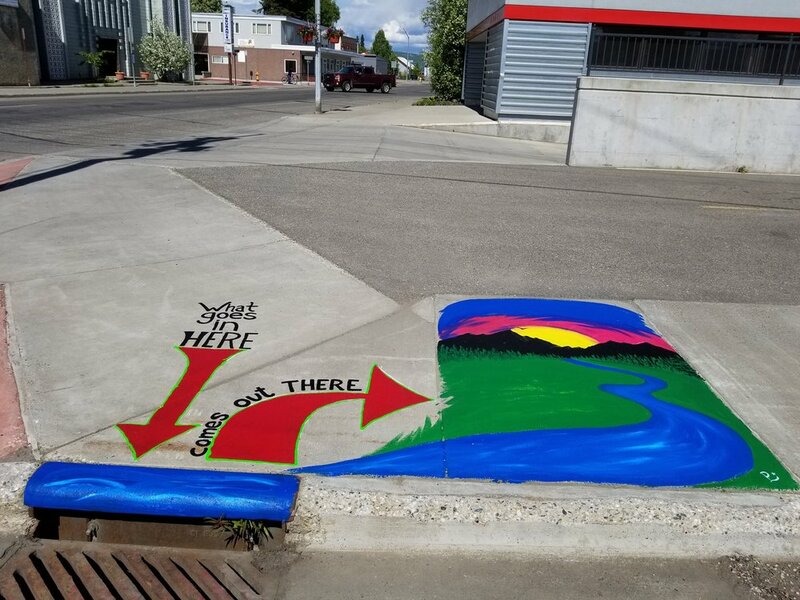 There are more people and steps involved. 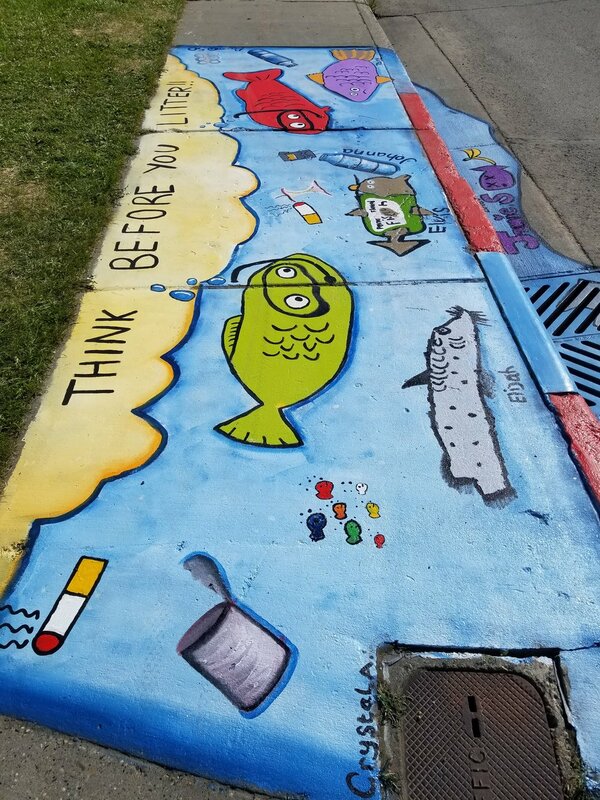 If you have any questions about how to be involved or ideas to make it better next year - please email Cynthia Nelson with TVWA at cynthia.tvwa@gmail.com. 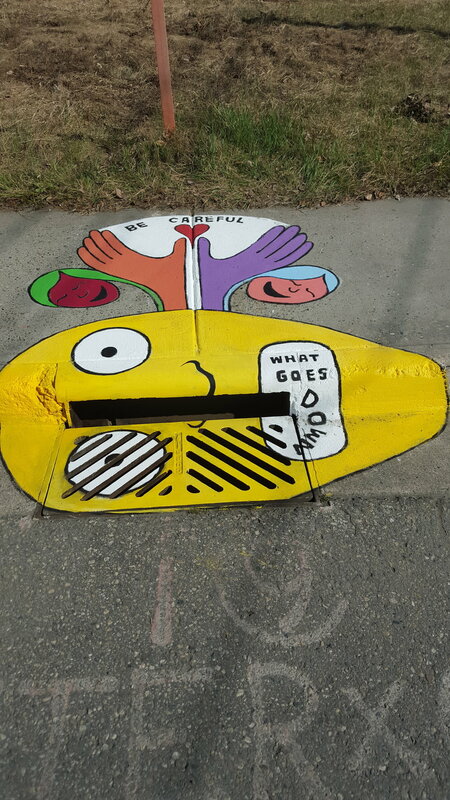 14 local artists submitted 22 of their creative ideas (many of whom submitted more then one idea). 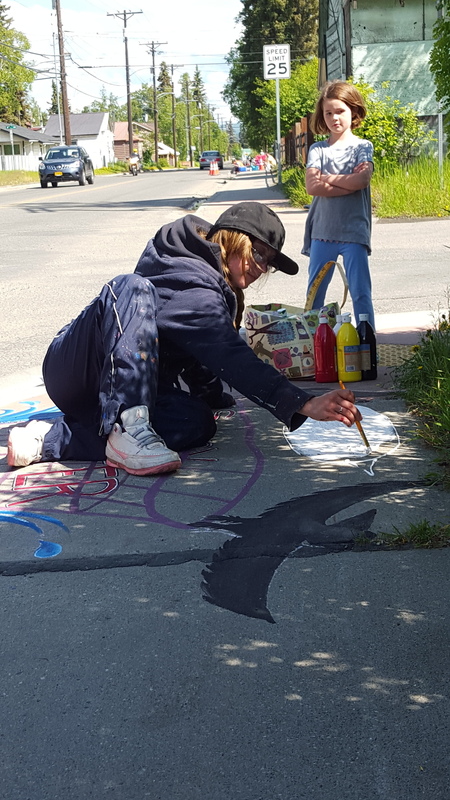 Of those art submissions, 13 were chosen by the attendees at the 2018 1st Friday Open House held at the TVWA on May 4th. 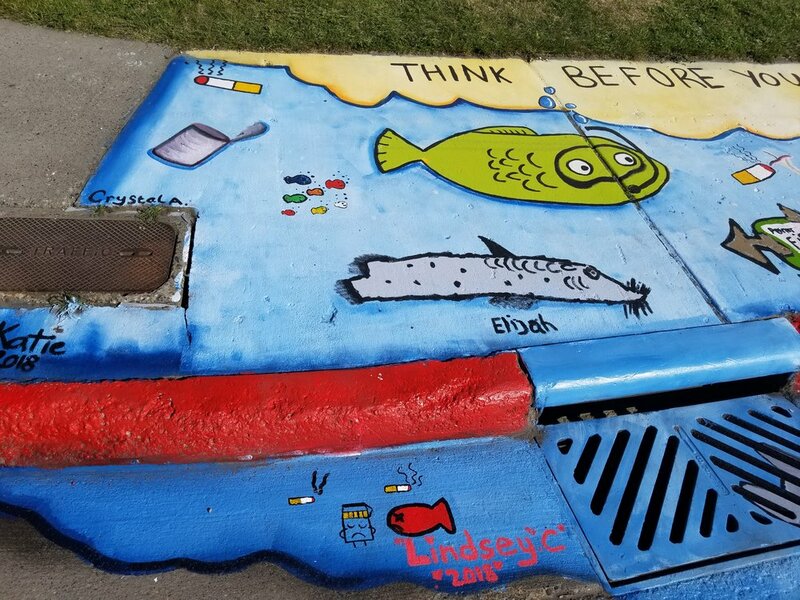 12 of storm drain paintings were completed on Saturday, June 2nd. 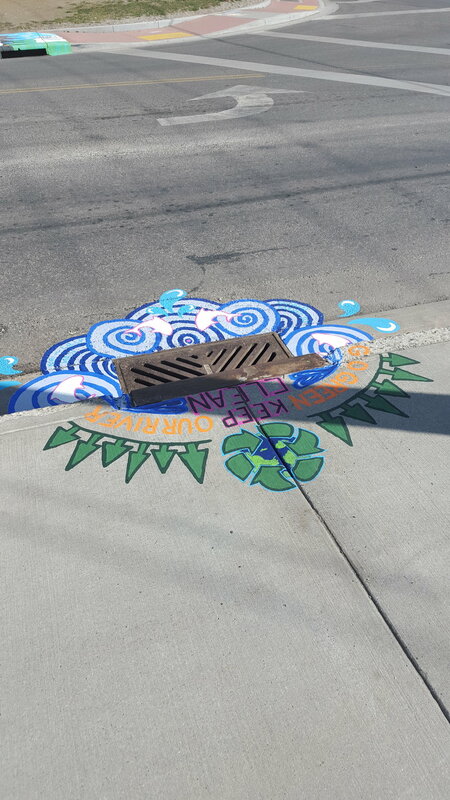 10 local artists submitted 20 of their creative ideas (many of whom submitted more then two ideas). 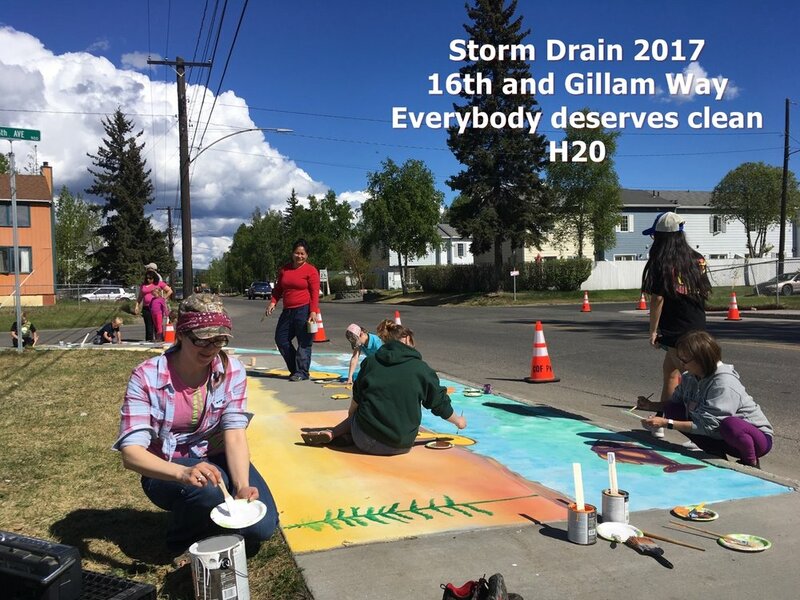 13 art submissions were chosen by the attendees at the 2017 Storm Water Advisory Committee Open House held at the Noel Wien Library on May 16th. 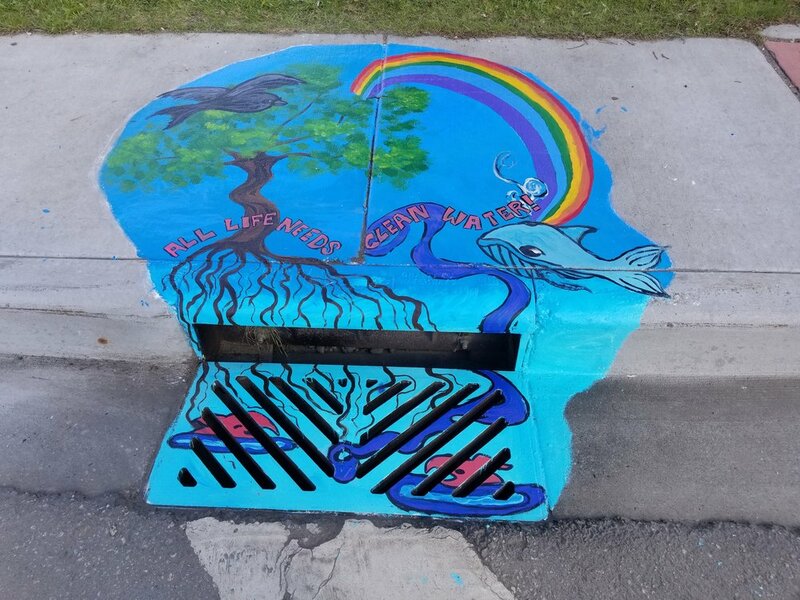 13 storm drain paintings were completed on Saturday, May 20th. 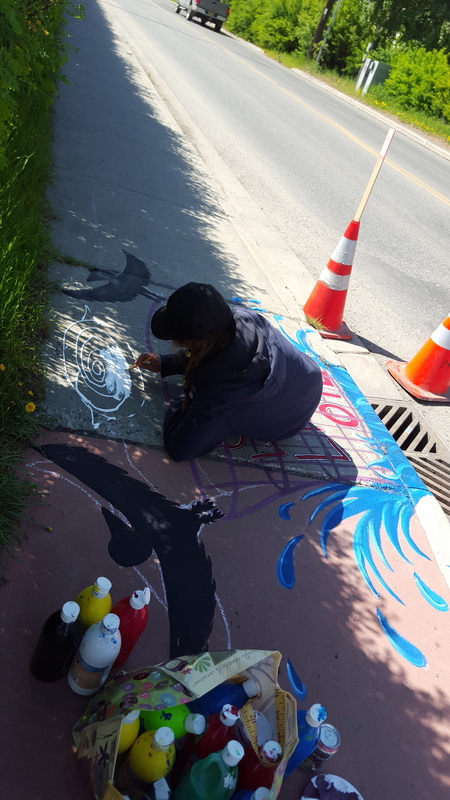 19 local artists submitted 23 of their creative ideas. 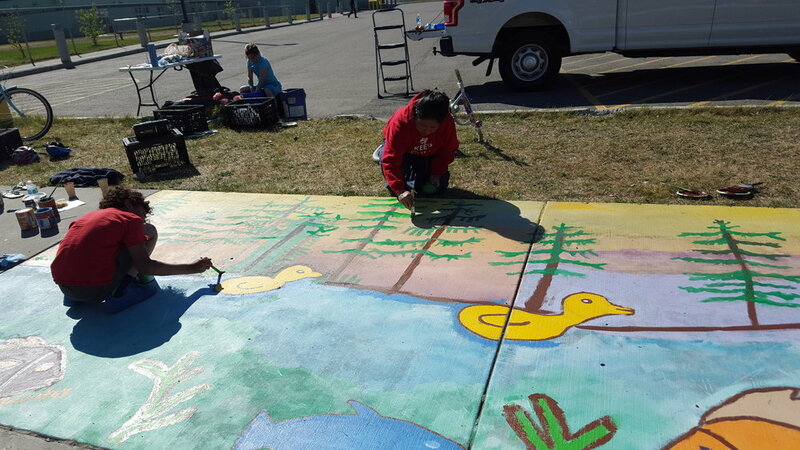 11 submissions were chosen by the attendees at the 2016 Arbor Day Celebration held at the Big International on May 16th. 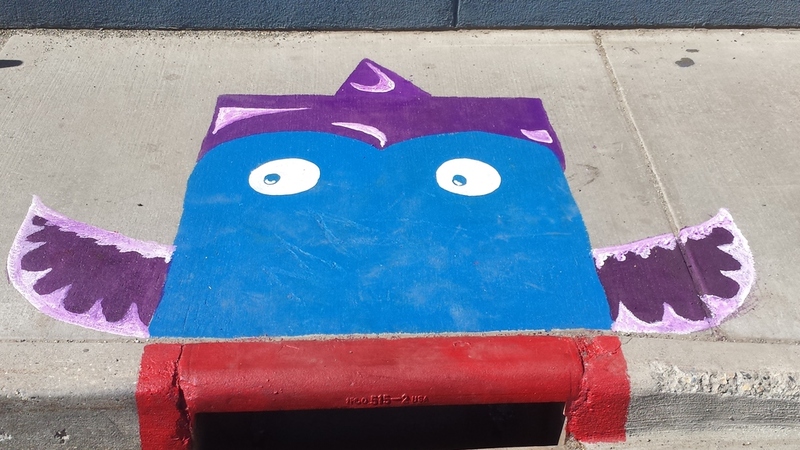 11 storm drain paintings were completed on Saturday, June 4th. 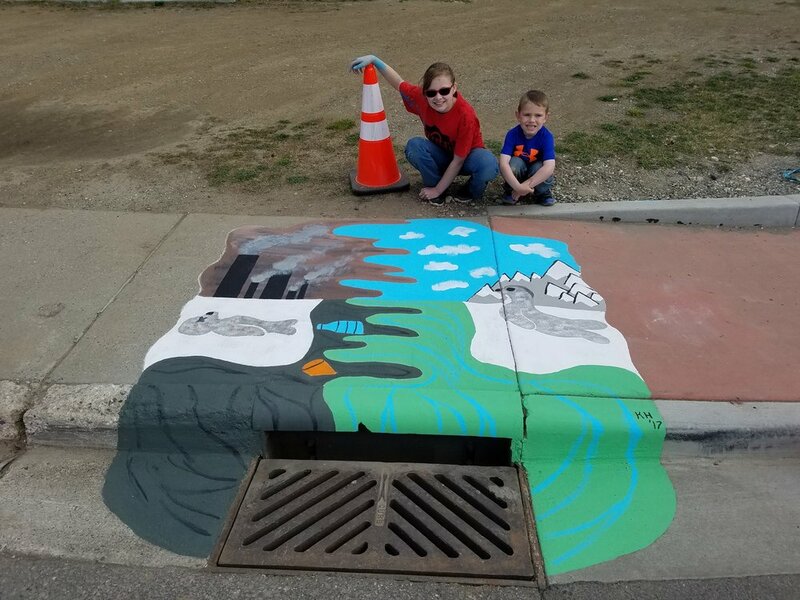 Our 2016 Storm Drain Art Contest made it into the Fairbanks Daily Newsminer! 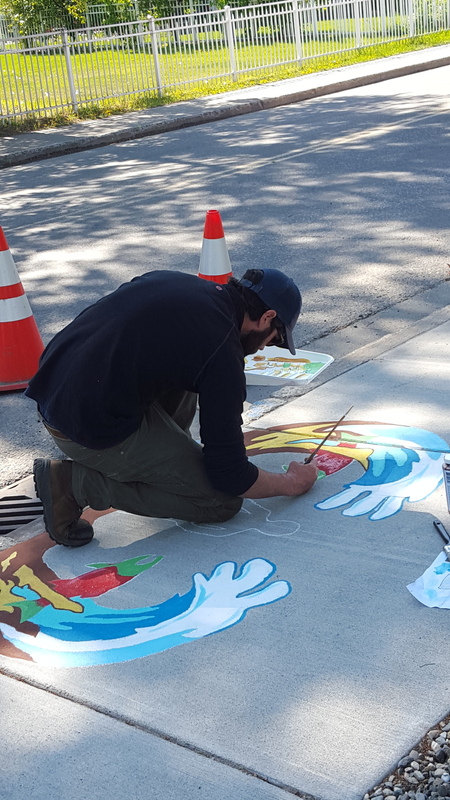 10 local artists submitted 16 of their creative ideas and 12 submissions were chosen by the attendees at the 2015, 1st Friday Event we held at City Hall on May 1th. 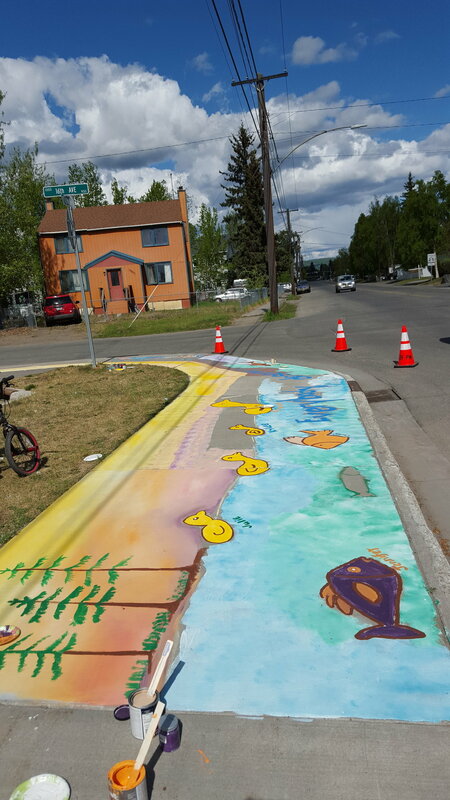 12 storm drain paintings were completed on May 16th. 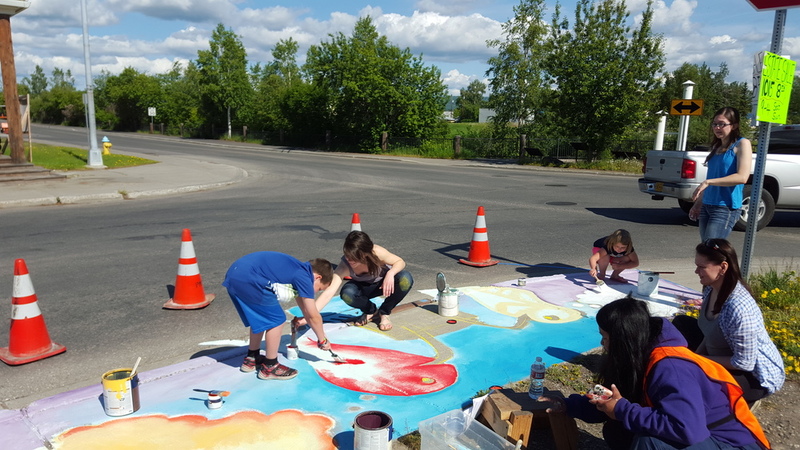 13 local artists submitted 22 of their creative ideas and 19 submissions were chosen by the attendees at the 2014 Chena River Summit on May 7th. 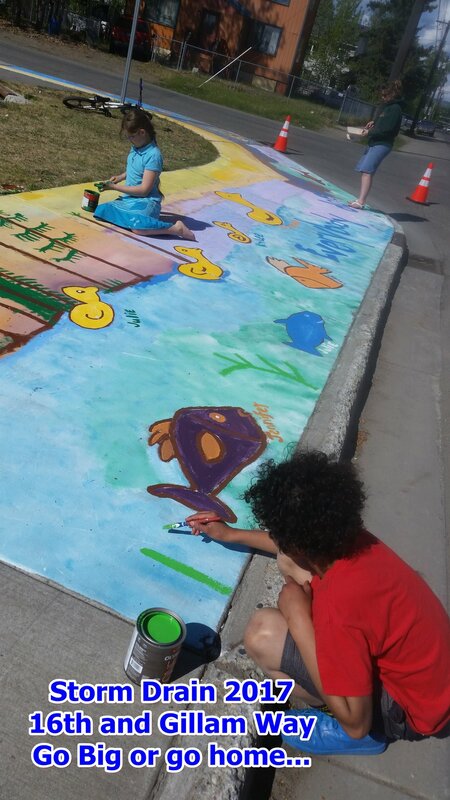 All 19 paintings were painted on June 7th and 8th. 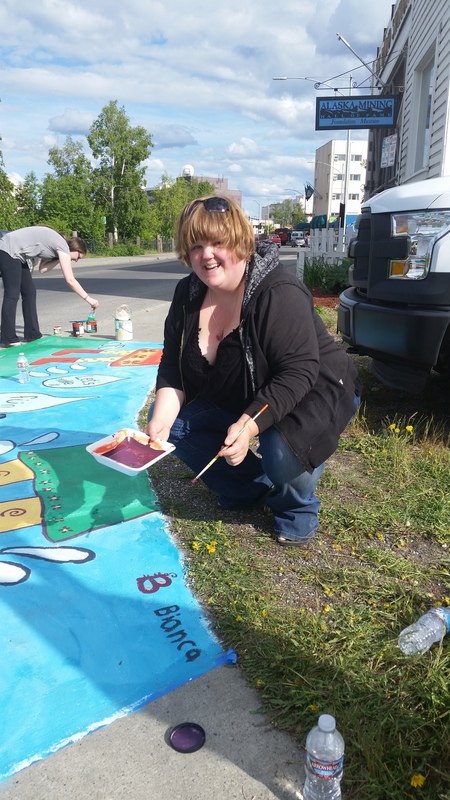 Click the image above to read the 2014 article in our local newspaper! 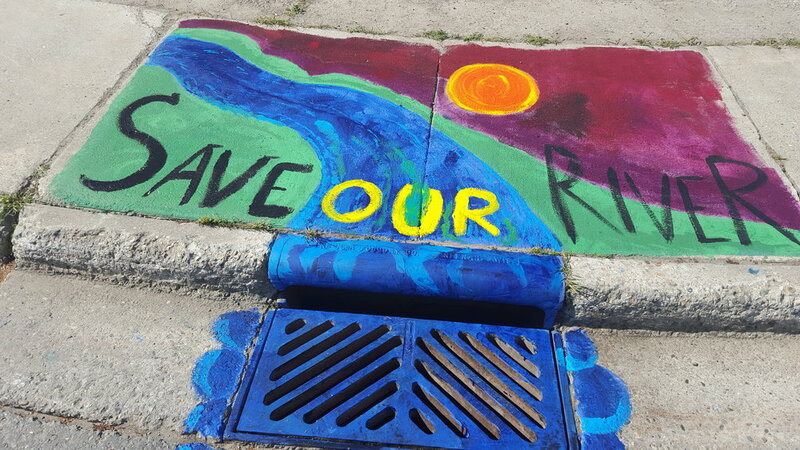 See the pictures below for samples of 2014 Storm Drain Art.